The Tiny Librarian: Tiny's Trendy Tuesday: Stripes, Orange, and Mexican food! Tiny's Trendy Tuesday: Stripes, Orange, and Mexican food! Happy Tiny's Trendy Tuesday: California Edition! Now, after that background information and Mexican food rambling, onto the fashion. I am excited to share one of my new favorite combinations...nautical stripes and orange. 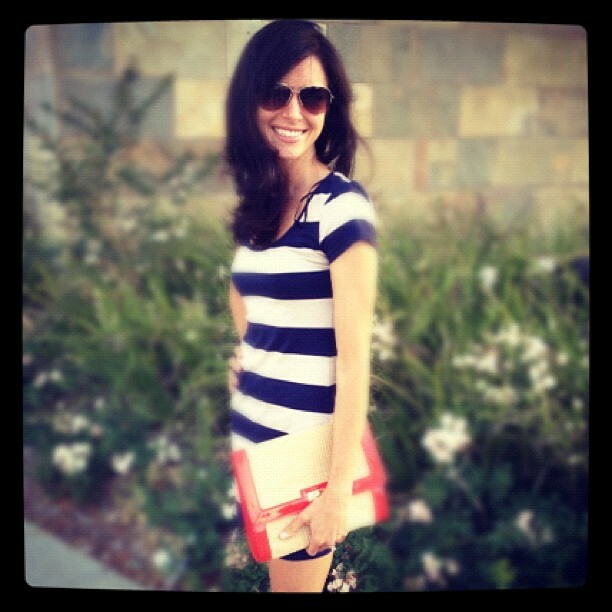 Adding the orange accessories to this casual striped dress give it that pop of color that is perfect for summer. This nautical (navy/cream) striped cotton dress is simple, yet with the right accessories, it is a perfect look for day or night. The dress is bit short and fitted, so it needs ideal accessories to ensure it looks polished and classy. I paired it with flat orange/cream sandals and a great woven orange clutch. There are methods to my fashion madness, but I realize I probably over think all these issues (as usual). :) Here is my thought process. First, I thought heels or wedges might tip the scales of the already short dress toward "streetwalker" (and I did not want my picture to end up on Fashion Police with the ruthless Joan Rivers). Therefore, I chose orange and cream flat sandals with a crisscross design for fashionable and chic look that even complements the cream color in the dress. I love understated matching! Second, because orange is such a bold, standout color, I decided on just a few orange accessories (gold/orange earrings, clutch, and sandals). Quoting the very fashionable and classy Coco Chanel, "Before you leave the house, look in the mirror and remove one accessory." I had on gold bangles, but then, I decided it looked better without them, because less is always more. 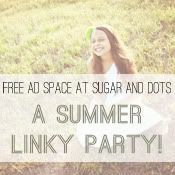 I am linking up with some other great blogger friends for their linky parties...Check out their amazing blogs too! 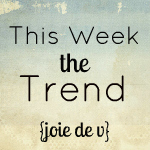 Thanks for checking out my post and reaffirming my fashion (over)thinking! :) I really appreciate the sweet comment and am following your blog now (loving the striped top and orange cropped sweater look with those matching sandals)! LOVE this dress. Totally agree about less is more with accessories. Awww...so sweet! :) I appreciate you stopping by my blog and leaving such a nice comment! 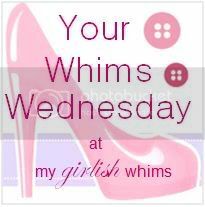 I am loving your blog too...great ideas and tutorials! Great color combination; perfect for summer, and you look great too! Adorable dress and I love the accessories you pair with it! Thanks for sharing and I am a new follower! Hope you have a great rest of your week! Precious! That dress looks so good on you! Super flattering. Such a cute dress! I love the large stripes and how you paired it with that color bag. nautical and orange?!? loovvee it! Love the pop of red! That clutch and those shoes...perfect! I have that same dress (love the price! )and paired it with yellow accessories to your orange :) I love it! Popping by from life lately! Ah! You are so cute and I love that you are a librarian. As a former high school teacher and a current English PhD student, I am pretty sure we would be great friends! You look incredible. That Mexican restaurant sounds great by the way. The freshest tortilla strips ever.